For decades -- or perhaps even for centuries, some firmly believe -- the infamous Men in Black have been elusive, predatory, fear-inducing figures that have hovered with disturbing regularity upon the enigmatic fringes of the subject of Unidentified Flying Objects (UFOs), coldly nurturing, and carefully weaving, their very own unique brand of horror and intimidation of a definitively other-world variety. The preferred tools of terror of the MIB are outright menace, far less than thinly-veiled threats, and overwhelming, emotionless intimidation. And they are relentless when it comes to following their one and only agenda -- that is, to forever silence witnesses to, and investigators of, UFO encounters. Unfortunately, it has to be admitted, they have been highly successful in achieving their unsettling goal, too. Indeed, and without any shadow of doubt whatsoever, the long and winding history of UFO studies is absolutely littered with fraught, frightened and emotionally-shattered figures that have been forever menaced into silence by the Men in Black, and who, as a result, have firmly distanced themselves from the UFO controversy, vowing never, ever to return to the fold. Like true vampires from some strange, outer edge, the painfully-thin, white-faced and sunken- cheeked Men in Black appear from the murky darkness; they then roam the countryside provoking carnage, chaos, paranoia and fear in their notorious wake, before duly returning to that same shrouded realm of unsettling weirdness from which they originally oozed forth. Very often reported traveling in groups of three, this definitive trinity of evil seemingly has the incredible ability to appear and vanish at will, and is often seen -- in the United States - driving 1950s-style black Cadillac's, and - in the British Isles - 1960s-era black Jaguar's, both of which are almost always described as looking curiously brand new. Despite the passing of the decades, and of the many and varied changes in fashions, the preferred mode of dress of these bone-chilling characters never, ever alters in the slightest, at all: it always consists of a well-preserved black suit, a black Fedora- or Homburg-style hat, black sunglasses, a black necktie, black socks and shoes, and a crisp, shining white shirt. Very little wonder, therefore, that they have been given the wholly notorious name with which they are, today, most famously -- or perhaps infamously - associated. While some MIB are, without doubt, the all-seeing eyes of clandestine departments of at least several governments -- including both the United States and the United Kingdom - the vast majority of these curious characters appear to be of a very different breed altogether. According to numerous, fantastic witness testimony and countless case-studies secured since the early years of the 1950s, the real MIB may very possibly be alien entities themselves, carefully and secretly working to ensure that we never successfully uncover the sensational truth about their presence, or the long-term goal of their strange and unearthly agenda, upon our very own planet. On the other hand, however, some students of MIB history, lore and legend suggest that these non-human creatures are utterly occult-based, supernatural beings that originate in, inhabit, and with disturbing regularity surface from, strange and enigmatic netherworlds very different to that of our own, personal 3-D reality. On a very similar path, a variety of individuals suspect strongly that the real Men in Black are nothing less than definitive demons -- the literal, deceptive minions of none other than the lord of the underworld: Satan himself. The intriguing fact that many of those that have been cursed by visits from the Men in Black have dabbled in occultism, with Ouija-Boards, and in devil-worship, is perceived as further evidence by some that the MIB may have origins that are far, far removed from the enigma-filled world of outer- space and highly-advanced extraterrestrials from the stars. Meanwhile, there are those investigators of the UFO phenomenon who have put forth a truly fascinating, unique and near-revolutionary theory that has nothing whatsoever to do with aliens, flying saucers, or even the realm of the occult. It is a definitively jaw-dropping theory that posits the Men in Black may, incredibly, be time-travelers from humankind's far-flung future. Their role, it has been suggested, may be to ensure that we remain forever in the dark about the shocking facts of what is really afoot: namely, that our "aliens" are actually us, albeit from a time centuries, or even thousands of years, from now. Whatever their point -- or points -- of origin, however, there is one thing that we can say with complete confidence and certainty about the Men in Black: they are, most assuredly, amongst us, and there is absolutely nothing positive, warm or welcoming about their presence at all. And, if your personal, particular areas of fascination are those relative to such conundrums as Flying Saucers, alien abductions, close encounters, the Roswell UFO crash of 1947, Area 51, UFOs, and a myriad of other, attendant puzzles, then that trio of mysterious, black-garbed men may very well one day be paying you a visit, too. If, late on some dark, thunderous and chilled night, you are awoken from an uneasy slumber by a slow, deliberate and pounding knocking on your front-door, no matter how tempted you may be, do not open it -- that is, unless you wish to disastrously allow into your life one of the most terrifying, soulless and definitively macabre creatures that has ever been unleashed upon us, the Human Race. Remember you have been duly warned. Beware, always, of the real Men in Black. To order The Real Men in Black from Amazon.com, click here! Nick Redfern's new book, The Real Men in Black, is a study of the real‐world equivalents of the Men in Black that, in 1997, were elevated to superstar status in the hit movie of the same name starring Will Smith and Tommy Lee Jones. Although the Hollywood blockbuster was fiction, the Men in Black really do exist, and they have consistently attempted to silence numerous witnesses to UFOs and paranormal phenomena since the early 1950s. In his book, Nick Redfern delves deep into the sinister world of these mysterious operatives. He reveals their origins and discusses classic cases, previously unknown reports, secret government files, and the many theories that have been presented to explain the mystery. 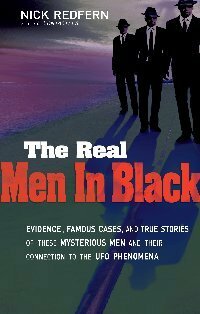 Highlights of The Real Men in Black include: (a) the story of Albert Bender, the first man to claim an encounter with the Men in Black; (b) the involvement of the MIB in the famous Mothman saga that dominated the town of Point Pleasant, West Virginia in the 1960s; (c) encounters with the MIB at the site of one of the world's most famous monsters: Loch Ness; and (d) exclusive interviews with leading researchers of the MIB phenomenon.